The Major League Baseball season is mere days from starting, but at least one club still has extension fever. 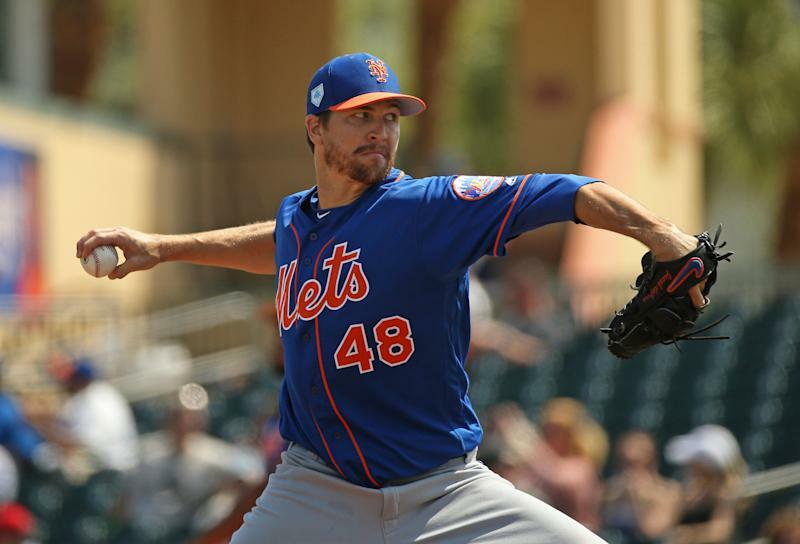 The New York Mets and their ace pitcher Jacob deGrom have agreed to a contract extension, according to Andy Martino of SNY. Ken Rosenthal of The Athletic had details about the extension, which is reportedly for five years and over $130 million, and includes a club option and one opt out. DeGrom agreed to new, five-year, $137.5M contract with #Mets, sources tell The Athletic. Covering 2019 to ‘23 with club option for ‘24. Opt-out after ‘22. Deal first reported: @MartinoNYC. The contract gives deGrom a substantial raise starting in 2020. He’ll still make $17 million in 2019, which was the number he and the Mets agreed on in January, but per Joel Sherman of the New York Post, deGrom will make $23 million in 2020, $33.5 million in 2021 and 2022, and $30.5 million in 2023. The 2024 club option is for $32.5 million. That’s a salary befitting the kind of numbers deGrom has put up. He was the 2018 National League Cy Young award winner, blowing everyone out of the water with his control and consistency. He started 32 games and pitched 217 innings, with an otherworldly ERA of 1.70. While this contract extension isn’t exactly out of the blue, it seemed like talks had stalled. In fact, his contract status had been an issue for some time, with his teammate Noah Syndergaard even mentioning it to reporters earlier in the week. The last six months between deGrom and the Mets had to be a little weird. deGrom won the NL Cy Young award with an insane ERA but a 10-9 record, which was an indication of how much trouble the 2018 Mets had supporting their ace. Then his agent at CAA, Brodie Van Wagenen, became the Mets GM. deGrom had to be represented by a different agent, and Van Wagenen said publicly that he would recuse himself from any deGrom contract talks. But deGrom, who was drafted by the Mets in the ninth round of the 2010 draft, must have liked what he saw from the Mets during the offseason. In addition to upgrading their front office (with his now-former agent), they made a big trade that brought in Robinson Cano and Edwin Diaz, improving both their offense and their bullpen at the same time. They signed Wilson Ramos at catcher, and stand to improve even more once Jed Lowrie and Yoenis Cespedes are off the injured list. Plus, they have mashing first base prospect Pete Alonso waiting in the wings. The Mets could be ready to make a splash in 2019 and return to the playoff hunt. Locking down the best pitcher in the National League is certainly a great way to start the season. Liz Roscher is a writer for Yahoo Sports. Have a tip? Email her at lizroscher@yahoo.com or follow her on Twitter at lizroscher.